Organiser: Threads - Felicity, International Institute Of Information Technology, Hyderabad. Registrations for prizes is must : Fill this doc. No penalty for Wrong submission. Watch out for hints and clues hidden in the problem statement. 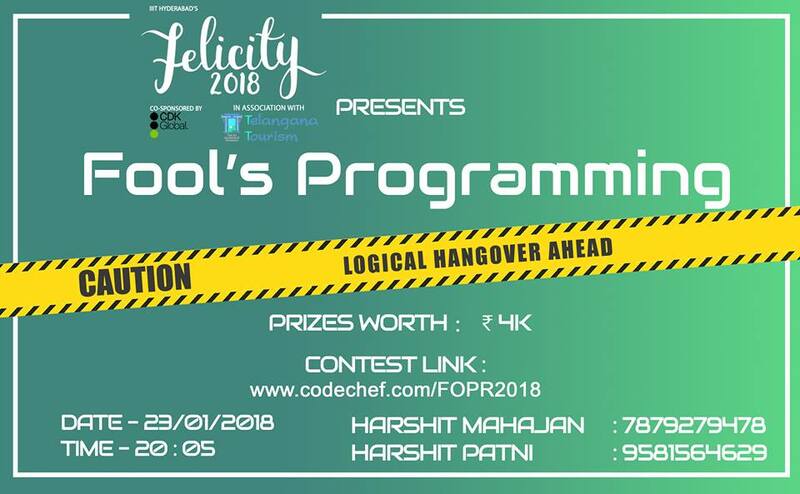 This unusual coding contest is based on April Fool's contest. Please contact harshitmahajan0904@gmail.com for any queries during the contest. The total time is the sum of the time consumed for each problem solved. The time consumed for a solved problem is the time elapsed from the beginning of the contest to the submission of the first accepted run. There is no time consumed for a problem that is not solved. Thanks to all of you for participating. I hope you all enjoyed it. Congratulations to the winners, your prizes would be delivered soon. Unofficial editorial is here . Amazing to see that 2 people were able to solve all the problems. Cheers to everyone, Adiós ! !